While some children spent their Easter weekend searching for hidden eggs, Pitt’s baseball team spent the weekend searching for its offense. Behind two stellar pitching efforts from visiting Notre Dame, the Panthers (11-19, 4-11 ACC) suffered a weekend sweep to the Fighting Irish. The Panthers have now lost seven straight games. Equally dismal, the team has not won a weekend series since March 13-15 when it took two of three games from No. 11 North Carolina. Notre Dame (20-10, 6-9 ACC) allowed only one run in each game of Saturday’s doubleheader, winning the games by scores of 8-1 and 7-1 respectively. In the first game, Irish freshman Brandon Bielak threw seven innings of shutout ball, striking out seven Panthers in the process. 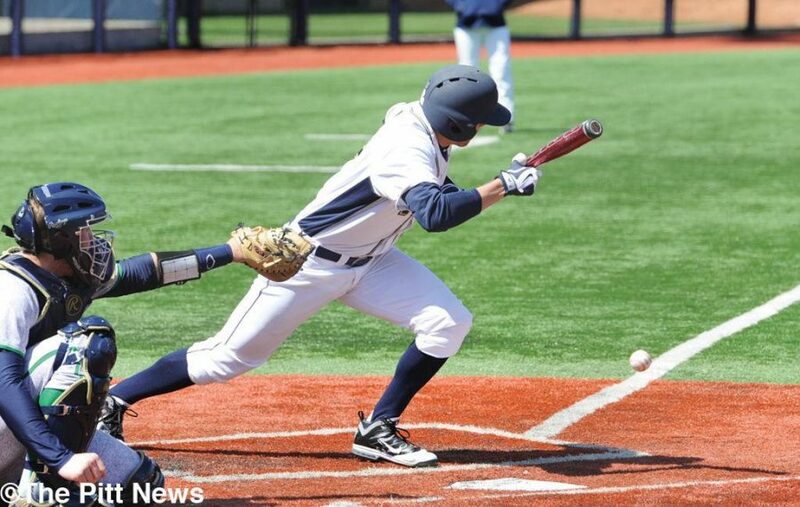 Pitt’s lone run came when senior second baseman Jordan Frabasilio led off the final inning with a consolation home run over the left field wall. But, by that point, the Irish had already built an eight-run lead. That offensive barrage came in the second inning, when Notre Dame’s junior shortstop Lane Richards poked a single through the infield, allowing senior right fielder Robert Youngdahl to score. Pitt sophomore T.J. Zeuch, who has struggled after a strong start this season, allowed a career-high seven runs in five innings. Jordano spoke bluntly after the losses and said the team’s struggles are beginning to stack on top of each other. In the second game of the day, Notre Dame did not let up on offense, tacking on seven runs and, again, allowing only one to the Panthers. Pitt’s only run against junior Nick McCarty came in the bottom of the seventh inning when senior left fielder Boo Vazquez hit a sacrifice fly to score sophomore designated hitter Nick Yarnall. By that point the game was already decided, as Notre Dame had gained a 7-0 lead. Pitt junior Aaron Sandefur picked up his fourth loss of the season, as he surrendered six runs — but only three earned — in five innings. Jordano, who is in his 17th year as Pitt’s head coach, said he has not experienced a prolonged losing stretch like this in years. In Sunday’s final game of the series, Pitt kept the score close before eventually falling to the same result as the previous two contests. Notre Dame struck early, scoring three runs in the first inning highlighted by a home run from senior left fielder Mac Hudgins. The Panthers responded in the bottom of the frame. Yarnall hit a home run of his own, scoring freshman shortstop Charles LeBlanc. Pitt’s scoring woes resumed after that first inning in the third game, while Notre Dame chipped in two more runs in the third and seventh innings. The Irish put the game away in the ninth inning, when freshman designated hitter Jake Shepski hit a single up the middle, scoring two runs and extending Notre Dame’s lead to 7-3. Pitt junior Marc Berube and senior Hobie Harris split the pitching duties, as each allowed three runs. Berube pitched the first four innings of the third game, and Harris came on in relief for the final five innings. Pitt next travels to Akron on Tuesday at 3 p.m. for one game before returning home on Wednesday to face Youngstown State at 3 p.m.